If you have any of the following symptoms, then you likely don’t have the typical dry eye problem, but likely have EYESTRAIN. nauseas senstation that deeply exhausts. The point to note is that dry eyes do NOT cause the terrible chronic pain when you close your eyelids (particularly seemingly behind and around the eyeballs). The fact you are having disgusting, murky pain when you close your eyelids is almost certainly acute eyestrain. Eye specialists are particualarly gifted with the inability to detect eyestrain, so you must diagnose this yourself. If you have undertaken excessive reading/ computer use. The third critical clue is that most eye doctors you visit will suggest that (a) your eye glands appear to be normal, (b) there is no damage to corneal surface. In sum, if your eyeballs feel sore (not just the corneal surface), you have recently undetaken excessive computer use, and a number of eye doctors can’t find anything seriously wrong with you, then you most likely have strained (a) eyeball muscles, (b) cheek muscles, (c) nose muscles, (d) eyelid muscles, and (e) neck muscles. In such a case you are VERY LUCKY, for you CAN VERY RAPIDLY (in just a few months) resolve most of your pain. Just follow the following steps. [Updated on 5 Nov. 2013 and raised to No. 1 step, displacing the eyeball movement section to second place.] 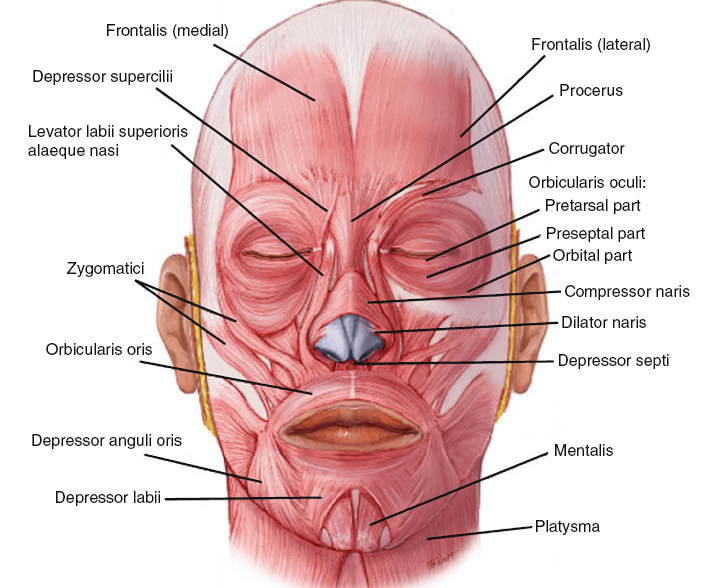 Most of the disgusting crunching/burning sensations noted above arise from non-eye muscles in the face. In particular, the muscles IN the nose and those connecting to the upper lip – these generally come together just outside the nose – are the MOST problematic of all. 1) Crunch the face, then release. You will need to experiment. The most extreme crunches/streches are called for. Else there will be no effect. 2) Press very hard on the sore spots. If this is the cause of your pain (almost certainly in the case of computer overuse), you will find innumerable sore spots in and around your nose, upper lips, cheeks, forehead, and around the eyes. Press very hard on these muscles (if necessary, rub a bit). You might need to rub and strech at the same time. Try all possible combinations. You will hear all kinds of crunching sounds as you press/release/strecth. In my case this has taken over 18 months and still there are muscles which are not fully released. Press the bottom of the nose (the nostrils) to the centre of the cartilage of the nose. You’ll probably feel a very sore spot. This pressing, as is done lightly in pranayam in Yoga, is very helpful in easing the tight nose muscles. 3) Dip face in ice-cold water: This is something I discovered much later, but has turned out to be an extraordinarily effective remedy. The idea is to get a basic with ice-cold water, then breathe in and dip the entire face in water while holding the breath. I do it just twice, given shortage of time, but it has been extremely effective in reducing the acute tightness of inner muscles. 4) Warm compress: Put a warm compress over the eyes/cheeks/nose, and pressing (quite!) hard wherever you experience any soreness. I find that at least 10 minutes is needed to achieve a positive effect. A direct result of all this should be that your eyeball ROTATIONS should be much easier, and you should hear less CREAKING noises while rotating your eyeballs. This is a greatly neglected part of the eyestrain remedy and I discovered ENTIRELY it on my own, after many months. It is surprising how tight even NOSE muscles get during eye work. Eye RSI builds up over many months/years of excessive computer work and won’t go away in a day. Delicate facial muscles are the most difficuilt to resolve. I’m still not 100 per cent OK. I get back many acute symptoms after focused work (including attending meetings in which I have to look at a particular person for an extended duration). Eyestrain also behaves somewhat like heel pain – i.e. it is most troublesome in the early morning. Over the course of the day, particularly after a long walk at lunch time during which one streches/crunches the eyes, the eyes can get better as the muscles become more supple. a) Do these eyeball movements. You must hear a creaking sound. That is the sound of eye muscles being released. Further update: Imagine your eyes are an electron revolving around a nucleus of an atom. Now shut your eyes and move them around in ALL axes posible. Not just up and down. Like moving a hoolahoop. Bring the fingers close to the eyes (about 1 cm) and move them around slowly. Gaze gently through the fingers. You should feel a sensation (if you have tight muscles) – that is the sensation of eye muscles releasing. Bring both eyes to look at something about 20 cm in front of you, and then unfocus. You should feel a crunching sound (if your eye muscles are tight). Repeating this (in all kinds of angles/postures) will help. Totally cross the eyes/ unfocus/ change focus and let the world become double/muddled up. Look close but “see” the distance. Look inward while seeing outward. A range of doubled up images is crucial. The periodic relaxation of the eyes during computer work is crucial. This exercise is typically found in most eyestrain websites. This is not really helpful unless you’ve done the earlier ones. However, once eye muscles have been somewhat loosened, this will help. Gaze with eyes wide open from the corner of the eyes. Depending on which muscles are tight, you will feel pain/tightness. Keep gazing – hard and strong. Invent all variations possible. Do air massage while doing this. Hold to 30 seconds or even more. Don’t worry if you blink. Move the head up and down and try to find angles where you experience tightness/pain. I believe that upward motion of eye muscles is very important (i.e. gazing at the ceiling with the head straight ahead), since during computer work, eyes mostly look downwards. Go out into a large open space (e.g. scenery with trees/hills) and look ahead but don’t see ahead. See all around the centre. Think of a doughnut view with the centre not “visible”. You’ll get a “grand” view of everything. It will lead to some crunching sounds as eye muscles loosen up. The goal is to get a “whole-of-world” perspective. Everything is visible, including all extremeties of vision. That means that even though you are looking ahead, you don’t really see the details of what is ahead. Something like playing basketball, when you look in the front but know exactly where the basketball is when you bounce it below your hands. This is similar to No. 4. In this case the eyes must experience the sensation of BOTH sides of the road rushing behind the head, even as the head looks right ahead. This is a sensation to “see” from the corner of the eyes even while looking ahead. Scrunch with all your might. Let the entire face be strained. Hold as long as you can. Then release – suddenly. As many times as needed. Each (sudden) release should be accompanied by a deliberate command to eye muscles to “let go”. Imagine that your eyeballs are burning holes into your cheeks. It is useful to scrunch one eye at a time, as well, to focus on one eye at a time. This involves “sucking in” the eyes/ pushing out the eyesballs. I find this takes a lot of practice, but believe this has been pivotal in loosening up the muscles. Eyeballs must be as wide as possible while pushing them out. 6a. Pop out the eyeballs while squeezing eyeballs inwards with eye muscles. Look out of the corner of the eye while doing this. Should hear a crunching noise as muscles release. 6b. Pull face downwards while popping eyes outward. This will elongate the face and stretch eye muscles. In this exercise you imagine you are a cow looking idly into the distance. Look but don’t see. You should not be able to recognise any individual object (even person). Details here. In this you look bring both eyes together to the centre, then take them outwards, and back again. 9. Rotate your eyeball inward, and then rotate it outward. This is DIFFERENT to the usual yoga eye rotation. It involves shutting the eye, then rotating your eyeball towards the back, then front. Then do the other way. This one increases relaxation of eye muscles by very gently opening the eyelids (very, very gently), then very gently closing them. Rotate eyeballs/ rub hands and let heat go into eyes, etc. Note that these exercises will NOT work unless the basic ones above have been successfully completed. Close eyes and ask ONE eye, at a time to relax. When you feel total lightness in the eye, as if it were floating on a cloud, then you know the eye has been relaxed. As the strain subsides, you will find that one eye is more painful than the other. That is because the less dominant eye undergoes greater strain than the dominant one. Details here. Almost certainly, you’ll find that the eys on the bottom (behind) the eyeball are tighter in both eyes than the upper ones. That is because looking downwards contracts the bottom muscles. These therefore get much tighter. It is possible (as happened in my case) that nerves which serve eye muscles are impacted by tight neck muscles. [See the history of this discovery.] With this release, pain levels should drop like a rock. Like any other RSI, however, the full release of extremely tight muscles can take years of exercise. Think of allowing the neck to be free. Allow the head to go forward and up. Allow the back to lengthen and widen. I have found it useful to think of myself as a schoolchild in year one, wandering around the walk to school, stopping by little ponds, pausing to look at tadlpoles (like the cow mudra, described above). The goal is complete relaxation and natural walking and sitting. 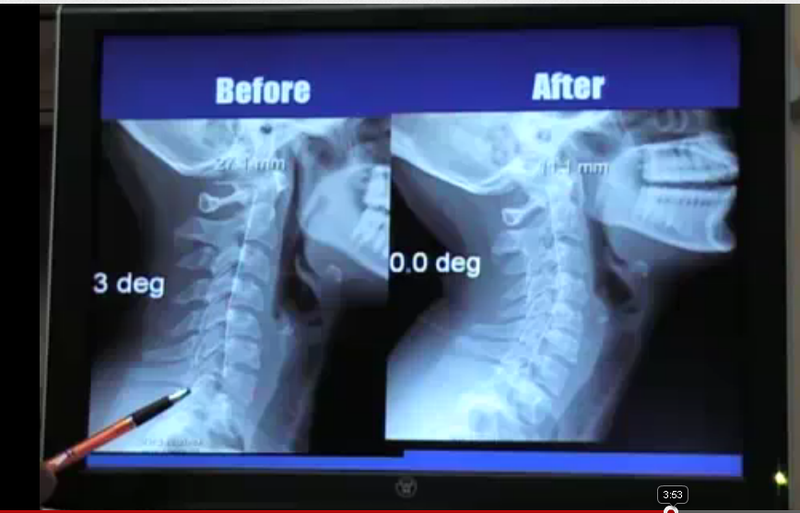 Good neck posture will look like the one on the right in the image below: a slight curve. Not stiff. I believe vitamin D deficiency might have something to do with this, as well. Most people with dark skin are vulnerable to Vitamin D deficiency since they work indoors. I’ve got Vitamin D deficiency, and just around the time I discovered that my problem was eyestrain, not dry eye, I started taking Vitamin D supplements. Vitamin D is critically connected with muscle performance. I don’t think supplements have helped, but I suggest if you have Vitamin D deficiency, that you take plenty of it as a supplement.. But what if you actually have dry eyes? Given the overlap between eyestrain and dry eyes, I believe that dry eyes is probably caused by compression of nerves that feed eye-glands. This can be tested by trying out the exercises above. If they help, then your dry eyes is related to eye strain. Note: if you DO have dry eyes you’ll find a lot of resources on this blog, based on my 18 months of research/ struggle over 18 months, believing I had dry eyes. Some of this material might be useful. Highly “qualified” ophthalmologists have simply no idea about the effects of excessive computer use on eyeball muscles. They mix up symptoms from eyestrain with symptoms of dry eyes or inflammation. The entire medical profession badly let me down on this issue. See this: http://sabhlokcity.com/2012/04/eye-problem-chapter-now-closed-despite-the-plethora-of-incompetent-doctors/. I’ve wasted over $3000 and found the opthalmological profession to be incompetent in basic diagnostics. I was left to my own resources to find out the solution. (Worse, most doctors I saw did not even have a helpful or empathetic attitude. They were NOT interested in understanding my experienced symptoms). The profession displays TOTAL DISARRAY and TOTAL CONFUSION about dry eyes/ eyestrain. I was repeatedly prescribed medicines, when I needed an ENTIRELY NEW SET OF EYE AND OTHER EXERCISES. The medical profession doesn’t have ANY useful understanding about eye strain/ dry eye. So you are on your own. Best of luck. I have now found the solution myself through hard work, trial and error and considerable experimentation. One day, when time permits, I might write more extensively about the most miserable days of my life that are now increasingly behind me. I don’t have the time to describe the physiology or biokinetics of eyestrain here. My experience highlights the ongoing need for critical thinking. MOST DOCTORS ARE QUACKS! MY ONE LEARNING HAS BEEN THAT DOCTORS ARE 90 PER CENT LIKELY TO MAKE WRONG DIAGNOSIS. DO NOT TRUST DOCTORS. READ WIDELY. THINK. ANALYSE. NO ONE KNOWS YOUR BODY BETTER THAN YOU DO. I also recommend that you consider REGULAR eye and other exercises (outlined above) if you undertaken extensive computer work. That will PREVENT the kind of eyestrain I managed to get. Once ounce of prevention is worth a pound of cure. So PREVENT. Exercise, stretch, rotate relevant muscles.